Traditional paper making relies heavily on lumbering, since the fiber found in wood pulp must be used as the main constituent. As consumption of paper continues to increase in our world today, so does the problem of global deforestation. 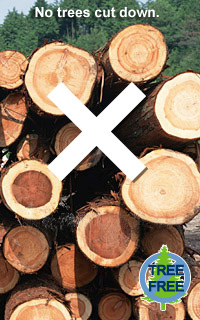 Today, statistical figures show that two out of every five trees are cut for pulp. A forest the size of a football field is cut down somewhere in the world every 10 minutes. In recent years, public awareness toward the deteriorating problem of carbon emissions has been in the spotlight. For the paper industry, however, its impact on the issue cannot be fundamentally reversed until a viable alternative for wood pulp is found. That solution is now available with the advent of ViaStone™. By not using any tree-based raw materials at all, ViaStone™ is meant to be a complete substitute for traditional paper, while achieving the goal of protecting our valuable forest resources. 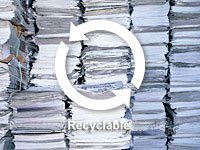 ViaStone™ is the new environmentally sensible choice for most paper products. As it becomes increasingly main-stream in a wide range of printing and packaging applications, a feedback loop of awareness about ecological preservation will be formed within our communities. At ViaStone™, our mission is to broaden the market reception of this exciting innovation, while highlighting the importance of protecting our valuable forest resources. Because only mineral powder (calcium carbonate), degradable resin and electric power are used during ViaStone™ production, there is no washing and drying processes needed, nor are there any harmful particulates released into the air. In comparison with the traditional paper manufacturing process, ViaStone™ does not require any water, strong industrial acids, bases, or bleach. Because of this, there is neither the problem of waste water being discharged during production, nor the danger of releasing the pollutants into water streams. 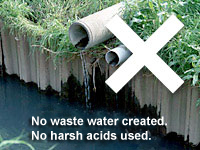 At ViaStone™, we are firmly committed to the protection of our water resources. 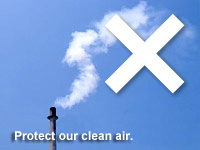 At ViaStone™, we are firmly committed to the protection of our clean air. To recycle traditional paper, water is added to the collected waste paper and mechanically blended, in order to regenerate the pulp. However, due to the old ink that remain on the waste paper, soaking and bleaching processes are required to remove the ink, in order to render the pulp reusable. In addition, the entire process of recycling has to be broken down into many complicated stages, each of those resulting in significant amounts of waste water. In contrast, ViaStone™ is easy to collect, conserves fresh water in the first place, and does not produce waste water consequently. 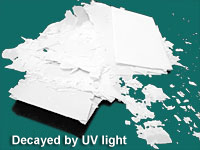 When disposed of, ViaStone™ can be collected as regular plastic material. After being pulverized and re-extruded as granules, it can then be used as an superior additive for the processing of polyethylene (PE) plastic. Suitable re-use applications include color plastic bags, flower pots, plastic cans etc. After being used, ViaStone™ can also be processed as regular trash that can be incinerated. Out of the main mineral power and the small quantity of non-poisonous resin contained in the product, only the resin substance is burned off. As the resin burns, the stone powder becomes detached, increasing the contact area between the resin and the air. This decelerates, but makes the combustion process of the resin more complete. Because of this catalytic reaction, no black fume due to lack of oxygen and incomplete combustion will occur. In addition, the non-poisonous resin does not discharge any harmful gas when burned, and the amount of carbon dioxide released is minimal, making a contribution to lessening the impact of global warming. Alternatively, if ViaStone™ is left in outdoor conditions, after approximately 6 months of being exposed to the sunlight, it breaks itself down like egg shell. Since CaCo3 is the main raw material, it returns to the earth naturally, causing minimal load on the environment. Same as the case with traditional paper, if ViaStone™ is stored indoors and not exposed to extreme amount of ultraviolet light, the resin will not turn brittle or decomposed. Also, ViaStone™ has the advantage over traditional paper in that it is resistant to yellow discoloration and insect damage. You can trust ViaStone™ to safeguard all your important documents and images. For added protection, choose a ViaStone™ model with surface coating technology to further prevent the effect of ultraviolet light.